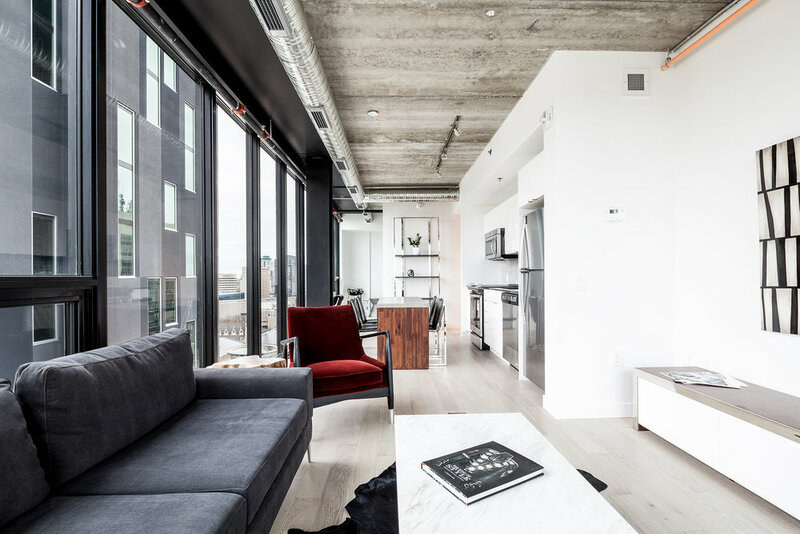 From brushed aluminum hardware to rich hardwood flooring and sophisticated porcelain tiles, every element of a Glasshouse Skyloft works together to create a chic, sophisticated look that is unique in Winnipeg. Floor-to-ceiling windows allow for optimum natural light throughout the space while offering stunning views of the city’s downtown and expanding your indoor space into outdoor space. 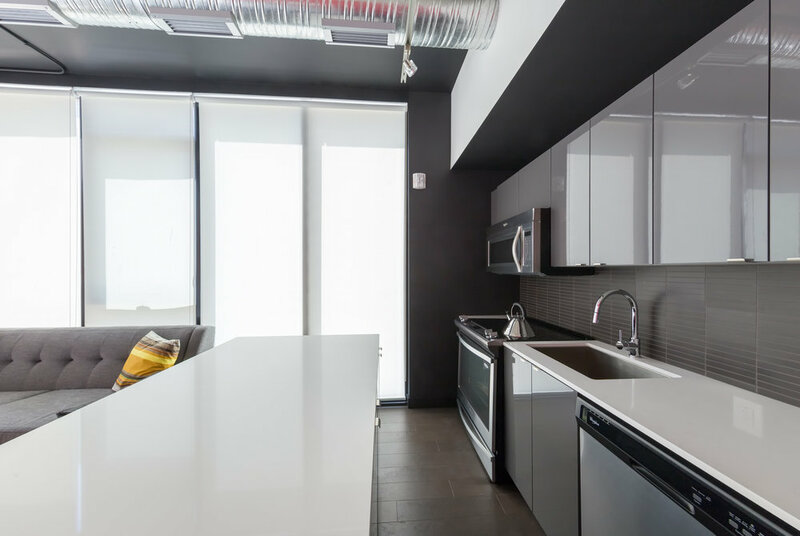 Because they are so much in view, Glasshouse’s open concept, European style kitchens are clean, modern and sleek. Featuring high gloss cabinetry and engineered stone countertops, they come with soft close doors and drawers, minimalist hardware, and stainless steel sinks with single-lever retractable faucets. Brand-name stainless steel appliances, including a fridge, dishwasher, slide-in-stove and over-the-range microwave, are included. Your kitchen is to show as well as use. 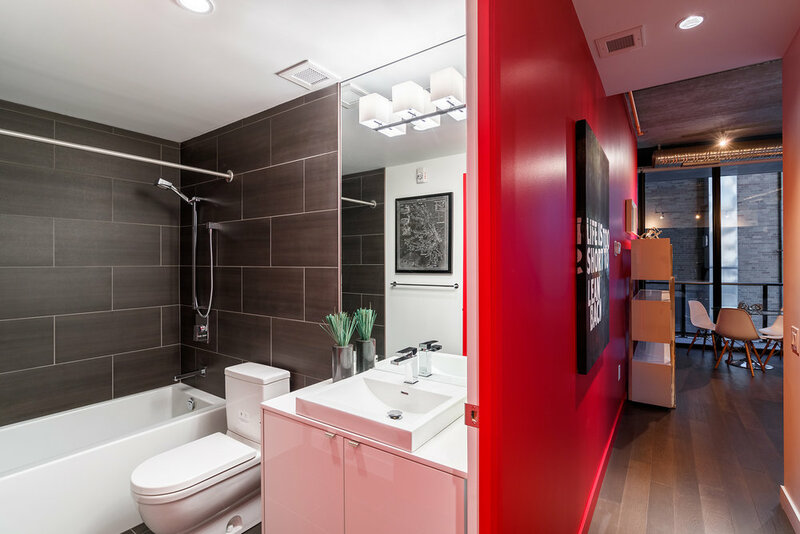 Glasshouse’s bathrooms are like contemporary spas, with top-mounted vessel sinks on engineered stone countertops, floor-to-ceiling porcelain tile, and ultra-contemporary all-white fixtures. Refresh or repose in style. At Glasshouse we omit no detail to ensure a clean, modern living experience.